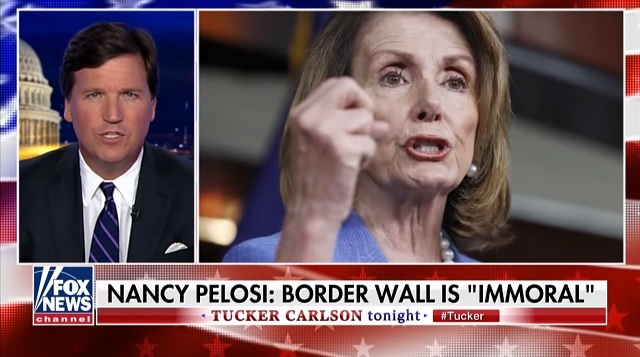 Fox News host Tucker Carlson on Friday night highlighted Nancy Pelosi's hypocrisy in claiming America building a border wall is "immoral" even though she voted in favor of Israel's wall. “Just in case you’re wondering if the new Democratic Congress will fund a wall along our southern border, we have an answer. Incoming Speaker of the House has cleared it up. ‘No chance,’ says Nancy Pelosi. ‘Walls don’t work,’ she explains, and more than that, they’re wrong. Morally wrong. Watch,” Carlson began. [...]"Weak moral authority. That is not a problem for St. Nancy. Her moral thought is absolute. She is a good person. You, unfortunately, are not. So pay attention as she explains once again — a border wall is immoral. Well, fine. Far be it for us to question the command of an archbishop. We’ll take her at her word. God hates walls. But if walls are immoral, what about fences? Obama seemed to like them." [...]"'Better fences,' says Obama. That sounds immoral. What about Israel’s security wall? It’s big and real and very effective. Pelosi supported it, actually. She voted for a resolution defending that wall from U.N. Condemnation. It’s confusing. Must have been before her conversion. But now [that] the walls are definitely immoral, a few obvious theological questions arise. What about doors? And locks? How about hedges or security systems or airport checkpoints or anything else that specifically designed to keep some people out? What about the gate in front of Pelosi’s weekend house? Is St. Nancy against all of that? Of course not." Right after this segment Tucker interviewed Univison anchor Enrique Acevedo who told him the US building a border wall is "immoral" but Israel's wall was A-OK.